As we prep for the baby to arrive, fishing time has gotten slimmer and slimmer. Thankfully, we have a river in the backyard. Like every late spring, I can look out over the Deerfield and see bugs doing their magical dance above the water. As a fly fisherman, it doesn't get much better. Don't get me wrong, I fully understand that trout do the bulk of their feeding beneath the surface, and I more than comfortable with nymphs and streamers, but nothing beats fish feeding on dries. Admittedly, I've been spoiled. I grew up a few short miles from Penns Creek in central Pennsylvania, one of the most well-known freestone flows in the state. I vividly remember my first ever trip during the infamous green drake hatch. Huge bugs filled the air (and your mouth if you weren't careful), and the later we stayed, the more big trout started to sip them down. I got skunked that night, but I was hooked. I've since experienced some incredible fishing all around the country, but as touristy as it is, I will always love the drake hatch and those giant flies. 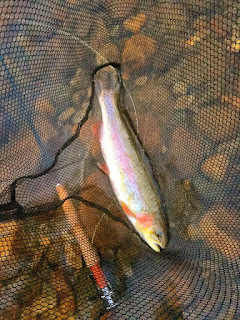 There have been a few net fillers this year, including this beast rainbow. On certain evenings, the Deerfield can almost replicate that magic. 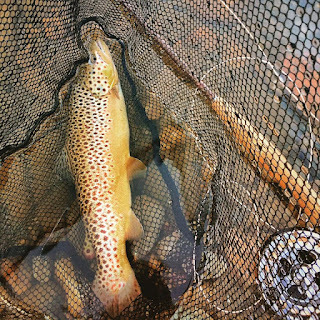 It does get a Drake Hatch, although alone, it falls well short of those in central PA. However, combined with a number of other bugs (including huge March Browns), the sheer number of insects in the air is amazing, and the fishing can be insane. I've been able to sneak out every few days for an hour or so just before dusk. Some nights, it is every cast. That isn't an exaggeration. Other nights, for one reason or another, I'm more than content with two or three fish. 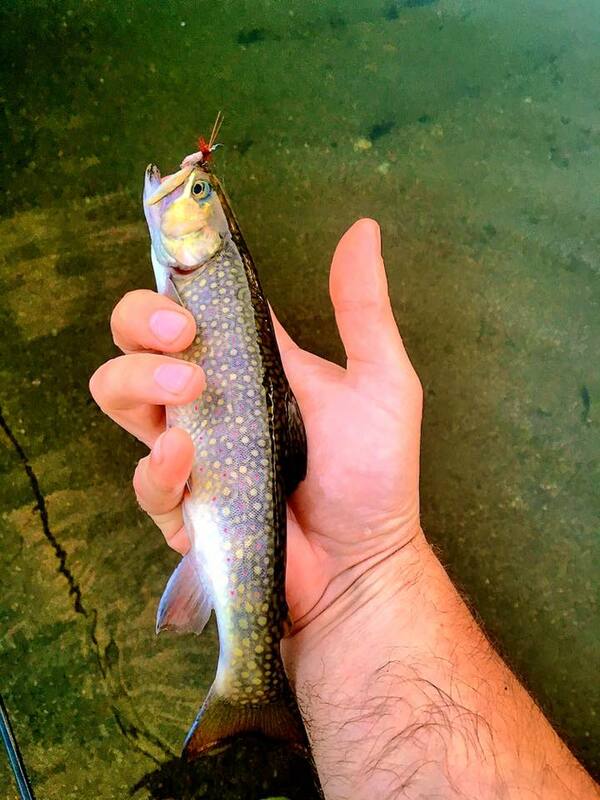 Brookies tend to start early. I assume that most are born as native fish in the river's tributaries. They aren't huge, but they are fun and beautiful. Then, the browns and rainbows start. These fish are a mix of stockies, hold overs, and natives, depending on the stretch you are fishing (some of which have all three). Oddly, they aren't too spooky in terms of wading fairly close to them in super clear water. However, they can be very picky when it comes to drifts and line management. One night, it seems like I can do no wrong. The next, I may get snubbed the majority of the trip. The fluctuating water levels in the river can change very quickly, and are often different each night. What worked one evening may have to be tweaked the next. Fish position differently in the different currents, and it impacts the timing of hatches as well. It makes fishing the same areas a lot more fun and challenging, but it can be equally frustrating when plan A turns into plan B and C...and D.
I've found that carrying two rods, including one with a 10'-11' leader and one with a 8' leader, can make a world of difference. Also, don't be afraid to go big. I almost always tend to downsize my flies, but these Deerfield trout don't mind big offerings if they look right. In fact, on many late spring days, I would argue that they prefer the bigger meals. Additionally, don't be surprised if the bugs you are seeing in the air an hour and a half before dark almost disappear by the time the bite really starts picking up on certain nights. Sometimes you can keep fishing the pattern, while on other nights it is best to re-tie. I also like to grab my kayak and float through some of the less pressured areas, getting out to wade at certain spots. This approach allows me to cover water early and target bigger fish when surface feeding starts. One last tip, and this is very general. I tend to fish in fairly muted or natural colored clothing most of the time. But I've noticed a clear trend lately. On days or nights when the bite is slow, I get probably 30%-50% more bites wearing my faded blue/grey Red Sox hat than I do wearing my fairly bright red RepYourWater hat. Keep that in mind the next time you dress to hit the river. The "insane" hatch season is slowly dwindling on the river, but it fishes well all year, particularly in the colder months (when it is safely accessible). But if you are new to flinging flies or simply want to go have some fun, the Deerfield likely won't disappoint. Good stuff! That brown is particularly stunning.